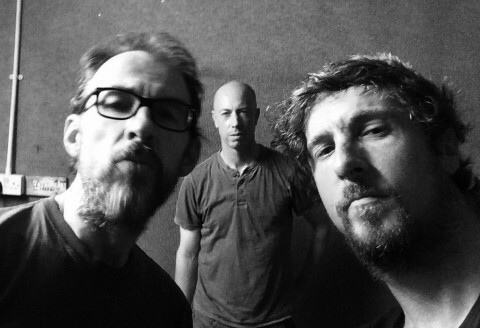 Gappy Tooth Industries at The Wheatsheaf, Oxford | The Gig Monkey Blog. My live review for the May issue of The Ocelot was a return to the barking mad line-ups of Oxford promoter Gappy tooth Industries, down at that bastion of the Oxford music scene, The Wheatsheaf. And as always. it was much better than you think it is going to be. 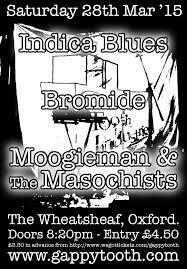 Once again exhibiting reckless abandon with my musical sensibilities I chanced another eclectic Gappy Tooth Industries line up at The Wheatsheaf in Oxford (one of my favourite venues, although seriously lacking in decent beer the night I went). GTI is something of an musical institution in the city and there are not many worthy bands in the area that have not snapped up their one and only chance of playing one of these shows and taking a proud place on a bill entirely unsuited to them. No one else operates in quite this deliberately stubborn and wilfully awkward way, with such a disregard for convention, putting on the line ups no other promoter in their right mind would consider. I applaud them for their standpoint, and every time I come to one of the shows and have got over the dizzying line-up I actually feel rather proud, and like I have been at a happening. And I don’t think there are many promoters who can say they have that effect on an audience. This gig was the 151st instalment of the concept so you assume they know what they are doing by now. Opener Moogieman and the Masochists are a Gappy Tooth band to the core. Eloquent, creative and rather nutty, they are a perfect snapshot of both the night, and Mr Tooth himself. A weird, poetic spoken delivery of disorderly, almost childish lyrics that wove eccentric stories about cucumber soup, pomegranate, outer space and a camera was unusual enough. But, it was layered over disjointed, lo-fi electro-folk that owed a nod or two to Sparks, not least in the morose, unsmiling demeanour of “The Masochists” themselves (an image that got shattered when the lady Masochist spent the whole of the next set dancing crazily Breakfast Club style). If you think this all sounds rather mad, you should have been there. Middle band were out of towners Bromide. And as is tradition at these shows, they sounded nothing like the openers. Instead they played an uptempo, high octane rock n roll in the vein of early 90’s bands Husker Du or Buffalo Tom, but on steroids. It was quite simply brilliant, a great marriage of pop melody and rock power. And damn if the band looked they were enjoying themselves, which always helps, one of my big musical bug bears is bands who just stand there and play songs with no visible sign of enjoyment (I of course discount purposefully sullen performances like above). Headline act Indica Blues were less of a sharp left turn from Bromide than they had been from the openers, but there was still a stylistic canyon between them. If doomy stoner rock, all down-tuned, downbeat and damn heavy is your thing, then get yourself to their next show, as their stock in trade is simply gargantuan riffs and monolithic rhythms. This is the sort of music that would repel Viking invaders from the shores of Norfolk with its gloominess, or could possibly be blamed for the extinction of many more sensitive life forms. Cracking stuff, but edged as band of the night for me by Bromide, whose was a set that was further up my street than the Google Street-View car. I think any live music fan who wants to be taken seriously needs to have at least one GTI show ticket stub in their collection. Long may they continue to do what no-one else will.